It's 12.20am and I'm sitting down with my laptop and a cup of tea ! Something stronger would be in order but I'm still buzzing and the cup of cha is good enough..........for now ! Firstly, I must say that I hope that the chap who required medical attention in the east stand is ok. Some things are more important than football. I trust that the club will make some announcement on that. What an evening that was and I don't think I want to endure anything like that again however sweet victory and salvation was in the end. I've never felt that we were even the fourth worse team in this league. Our problems are of course our attacking deficiencies. Our defence is pretty decent and like last season I thought we'd be ok with a back five of Hamer / Alnwick, Solly, Wiggins, Morrison, Dervite ( Wood / Court ). We were affected by the long term injuries to our full backs of course. I wasn't impressed with Watford. Fair play that they weren't just there to make up the numbers but their dirty approach was just unnecessary. They were lucky to only have one player sent off. I hope that number 15 is severely dealt with following his shameful conduct. Most of their team seemed to lose their discipline in a game that ultimately mattered little to them. Deeney is impressive and could surely do a job at a higher level. He possesses pace and strength with an eye for goal. The one he scored was a belter and I feared the worse when he did. We did well to weather the storm that followed. I, and I guess, many others were pleased to see the starting eleven tonight. We always score three at home when Wilson plays wide right don't we ? The side had a good look about it and Cousins seemed more at home in a central role. I'm pleased for Harriott that he is finishing the season strongly. His second goal was superb technically, I quite enjoyed that ! All the players deserve credit and of course one must mention Skip. Jackson isn't overly demonstrative as a captain but is constantly prodding and geeing up the team as he quietly goes about his job. I suspect that off the pitch he is very much the avuncular Johnnie Jackson to the younger players. I suspect that Andy Hughes is a similar good influence in the dressing room. Riga deserves great credit of course. I doubt that many managers, even more experienced ones could have taken over the team in such circumstances and achieved what he has. I simply didn't think we could endure the relentless battle of two games a week. Jose has got the best out of the majority of the players. Yes, the players should be able to play twice a week but it's the mental more than physical side of things that takes its toll. That must more especially be true of the younger players. However, they have all shown superb mental strength. It's is a remarkable feat. Back to back wins can make all the difference but it's incredible to think that we have secured safety with a game to spare without having achieved that in the league this season. Perhaps that could be put right on Saturday ? There are so many reasons as to why this season has been so awful but they can be examined another day. As many have remarked this would have the most unnecessary relegation in our history had it happened. We now have an opportunity to take stock and plan for the future. I got my ticket for the player of the year do last week. I'm really going to enjoy that now ! I wish I was going to Blackpool now if only to banish the memory of the last time I was there and the 5-3 ( ? ) defeat under Mildew. Sadly I'm not but I am pleased for those that are going and that they can truly enjoy their trip up there. For now we can sit back and let the fans of other clubs do the worrying. 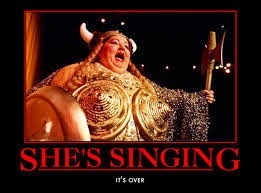 The fat lady has sung and for once, it's in a good way. Well Done The Foxes !